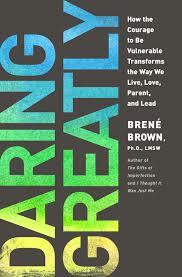 A Review of Daring Greatly: How the Courage to Be Vulnerable Transforms the Way We Live, Love, Parent, and Lead. I’ve spent the past few weeks telling everyone I know to read this book, so I thought I would put together some sort of official book review. Although I mention the books I’ve read or recommend in my monthly “What I’m Into” post, this is the first book review I’ve ever done on the blog. I think this book is powerful and I hope if you haven’t read it yet, that you will soon. Brené Brown is a skilled researcher with a Master’s and PhD in social work. She has dedicated the last decade of her professional life to studying shame and vulnerability. Her two TED talks on these topics have been viewed by over This book is the perfect mixture of hard data and personal stories and her message is one that I believe every human being can relate to. This book does not apply to people of one particular religion, race, family demographic, or socioeconomic status. It is a book for everyone. She explains how this sense of shame stems from the feeling that “I’m not enough.” Not pretty enough, thin enough, smart enough, rich enough, successful enough, funny enough, etc. Brown states that shame blocks our ability to make meaningful connections with others, and the only way for connection to happen is through vulnerability – allowing ourselves to be truly seen. Brown goes on to identify the “vulnerability-shields’ people put up to protect themselves from being real with others (perfectionism, forboding joy, and numbing being the major ones) and to give the “daring greatly” alternatives to these behaviors (embracing the beauty of our cracks, practicing gratitude, and finding true comfort). I think Christians (in the Reformed tradition especially) have some push-back against the idea of our own worthiness. We balk at expressing what we perceive to be an overly high opinion of ourselves. What about being hopeless sinners in need of Christ’s grace? I would argue that Christ’s grace is exactly why we need to see ourselves as worthy. That we are worthy because of the work of Christ. Maybe failing to see our worthiness is really a failure to understand and accept the work that Christ has done for us. Maybe combatting shame and embracing vulnerability are essential to how we live the gospel. This book is making me consider the kind of person I want to be. It has challenged and encouraged me to identify places of shame in my life and to combat them. Embracing our imperfections and our messiness is something I had already been thinking about and writing about a lot over the past year, and this book has confirmed for me that this is crucial to living an abundant life and to becoming the people we want to be. If you don’t feel like you have time to read the book, or just want to hear more before you do, here are Brené Brown’s two TED talks. They are well-worth the 18 minutes of your time.